Stocks posted their second consecutive weekly rise on Friday as investor sentiment was boosted by better-than-expected jobs data and progress on the U.S.-China trade front. The S&P 500 and Dow Jones Industrial Average both climbed about 2% this week, while the Nasdaq Composite surged 2.7%. On Friday, the S&P 500 and Nasdaq closed higher by 0.5% and 0.6%, respectively, while the Dow climbed 40.36 points. Materials and financials were the best-performing sectors this week, rising 4.3% and 3.3%, respectively. Bank shares led the gains in financials. Morgan Stanley jumped more than 6% this week, while Goldman Sachs, Bank of America and Citigroup all ended the week up more than 5%. J.P. Morgan Chase, meanwhile, gained 4%. "It's such a comfortable place to be in as an investor," said Jason Thomas, chief economist at AssetMark. "The unemployment rate is low, so that's going to keep consumer confidence high, but it's not so low that wages are growing quickly. From the shareholder's perspective, margins are expected to remain high." The U.S. economy added 196,000 jobs in March, according to data released on Friday by the Bureau of Labor Statistics. Economists polled by Dow Jones expected a print of 175,000. The U.S. unemployment rate, meanwhile, remained at 3.8%. However, wage growth expanded 3.2%, below an expected gain of 3.4%. Wall Street was looking forward to this report after the previous jobs data showed growth of just 20,000. That number was revised higher to 33,000 on Friday. "This number is right in the middle. It is not one of those huge beats and it's not disappointing," said Lindsay Bernum, head of macro at Smith Capital. "It really aligns with our view that the foundation of the U.S. is intact. We are not growing at the same pace as last year, but we're not out of the game." Friday's strong jobs report comes after the release of disappointing economic data earlier in the week. Activity in the U.S. services sector fell to its lowest level since August 2017 while payrolls data released on Wednesday was also below expectations. Traders and financial professionals work on the floor of the New York Stock Exchange (NYSE) ahead of the opening bell, January 4, 2019 in New York City. 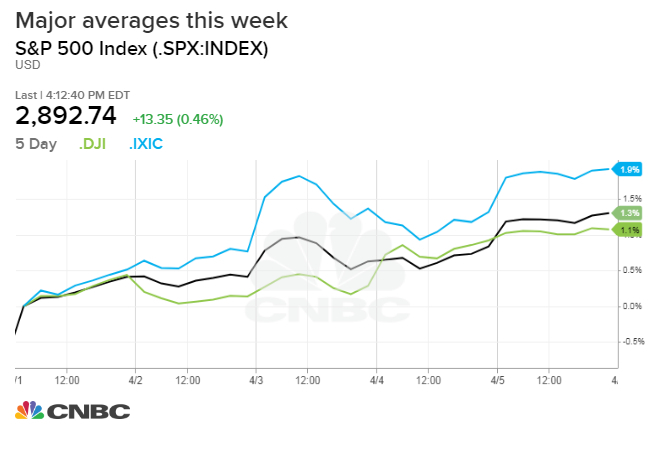 Stocks also got a boost this week as China and the U.S. appeared to make progress in trade negotiations. President Donald Trump said Thursday that swift progress had been made, adding "we'll know over the next four weeks" whether a deal can be reached. Chinese Vice Premier Liu He, meanwhile, said new consensus had been reached by both countries on the text of a trade agreement, according to official state news agency Xinhua. This week's gains come as investors brace themselves for the upcoming earnings season, which is set to start next week with J.P. Morgan Chase and Wells Fargo among the companies set to report. "Earnings drive markets. That's going to make the biggest difference going forward. I think not just the earnings themselves; everybody wants to hear about what CEO expectations are about trade. That's going to continue to be a big thing," said JJ Kinahan, chief market strategist at TD Ameritrade. —CNBC's Ryan Browne contributed to this report.